The Curious Wavefunction: Thermodynamics in drug discovery: A Faustian bargain cooked in a devil's stew? Thermodynamics in drug discovery: A Faustian bargain cooked in a devil's stew? Driving drug design by studying the thermodynamics of ligands binding to proteins has always seemed like a good idea whose time has come. It all sounds very attractive: at its heart every molecular recognition event is driven by thermodynamic and kinetic principles, so in principle one would be able to figure out everything they wanted to know about the details of such interactions by accurately calculating or measuring the relevant parameters. Surely the main hurdles are experimental? The truth though is that we now have good experimental techniques to investigate thermodynamics, and yet nobody still seems to have figured out what’s the best way to apply the idea prospectively to new drug discovery projects. However there has been an increasing awareness of the breakdown of the free energy of binding into enthalpy and entropy: part of this awareness has been driven by analyses of drugs indicating that the best drugs have their enthalpies of binding rather than their entropies optimized. The conventional wisdom gleaned from these and other studies seems to be that optimizing enthalpy is tantamount to optimizing protein-ligand interactions while optimizing entropy is tantamount to displacing water molecules and building in hydrophobic modifications. This seems to indicate that one must try to optimize enthalpy through specific interactions early on in the drug development process, no matter that doing this is usually very challenging since you can often end up simply trading one hydrogen bond for another, leading to a net zero impact on binding affinity. Now there’s a new, very comprehensive and readable review dealing with these matters out in J. Med. Chem. which demonstrates just what kind of a devil’s stew this matter actually is and which asks whether thermodynamics is still a 'hot tip' in drug discovery. The authors who are from Astra Zeneca in Sweden look at a variety of topics related to protein-ligand thermodynamics – the gory details of ITC which is the experimental workhorse used to determine the thermodynamic quantities, case studies showing that displacing water can sometimes help and sometimes hurt, the convoluted phenomenon of enthalpy-entropy compensation, the whole fundamental idea that water molecules are all about entropy and interactions with the protein are all about enthalpy. They reach the conclusion that a lot of the conventional wisdom is, if not exactly incorrect, far too simplistic and often misleading. As always, reality is more complex and subtle than three round numbers. They find cases where displacing water improves the free energy of binding, not through entropy as one might expect but by strengthening existing interactions or effecting new ones, that is through enthalpy. There are also cases where displacing water makes things worse because the ligand is not able to pay the desolvation penalty imposed on its polar groups. There have already been reports looking at networks of water molecules not just in the protein active site but also around the ligand, and the subtle movements of these networks only serve to complicate any kind of water-based analysis. And as the authors demonstrate, simple observation of SAR can be very misleading when applied to conclusions regarding displacement of water molecules or formation of specific interactions: for instance, even ligands that have the same binding mode can showcase differing water networks and protein conformations. The conclusion the paper reaches is not exactly heart-warming, although it points to some future directions. The main question that the authors try to answer here is whether the measurement of free energy, enthalpy and entropy can prospectively help drug design, and their answer is largely negative. The fundamental reason is that all these quantities are composite effects so they mask individual contributions from protein, ligand and water. The contribution of a particular hydrogen bond to affinity is not an experimental observable, and trying to over-interpret thermodynamic data in order to divine such contributions may easily lead you down the rabbit hole. There is a multiplicity of such contributions that can result in the same number, so the problem is really underdetermined to a large extent. 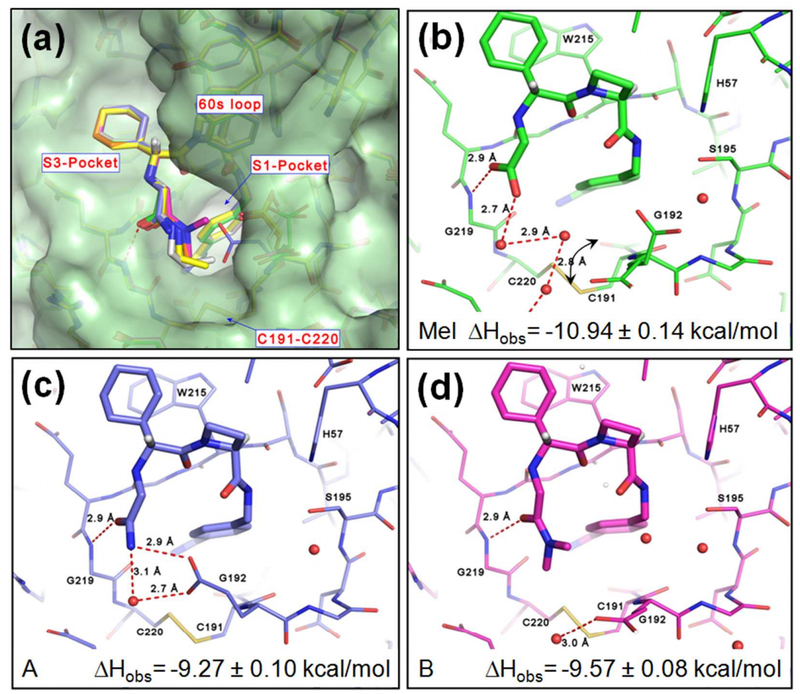 As the review indicates, all that prospective measurement of thermodynamic quantities can do is point to obvious outliers that might be causing very large protein conformational changes or leading to radically different ligand conformations. Although I would think that an eagle-eyed medicinal chemist armed with some structural expertise and robust SAR data might be able to reach the same conclusions. Thermodynamics has always been one of those beloved children of drug discovery, one on whom the parents have pinned their high hopes but who still has to turn that potential into real achievement. As this review demonstrates, there is much complexity hidden in the heart of this prodigal child, and until one unravels this complexity his beatific smile will remain a cloudy crystal ball. Ligand Binding Thermodynamics in Drug Discovery: still a hot tip?